Blockchain for Climate is currently developing an international tool for connecting all national carbon accounts worldwide. The foundation is working on the initial national deployment — Canada — and placing Canada’s national carbon accounts on the blockchain. This will help support Canada’s leadership position in addressing climate change. Blockchain for Climate is focused on building on the Ethereum blockchain and building a PoA algorithm for this system. Each country and group such as the United Nations Framework Convention on Climate Change would operate at least one node. The vision for Ethereum 2.0 with PoS is that it will have a much lower carbon footprint and energy usage. The ability to have shards, side chains, and state channels would result in lower gas costs. Blockchain for Climate plans to build a fast and secure PoA system that will transact back to the Ethereum mainnet at regular intervals for extra security. Blockchain for Climate has a team working on understanding the nuances of the Paris Agreement as well as a team focused on building a working group with other national parties. The working group includes responsible parties within the national governments of the world who are working with the UNFCCC and will help provide insight on UX, UI, security, and technical issues. Much as CryptoKitties uses ERC-721 NFTs to keep track of native token data (eye color, generation, and the like), Blockchain for Climate plans to use NFTs to track native token data (country of origin, project, and so on) of each emission-reduction token. However, because only one token can be moved at a time, ERC-721 would not be practical. Zac McClure, co-founder of TokenTax, will join us on February 6 to discuss the implications of taxes on cryptocurrency. TokenTax reports cryptocurrency capital gains and income taxes and supports over 30 exchanges. McClure will provide a global perspective on crypto tax regulations as well as common practices for U.S. taxpayers. Be sure to subscribe to our YouTube channel to watch live and meet community members in the live chat. You can also find OST LIVE on your favorite podcast app, including: iTunes, Alexa, Spotify, CastBox, Google Play, TuneIn, Stitcher, PodBean, Overcast, and Player FM. OST blockchain infrastructure empowers new economies for mainstream businesses and emerging DApps. OST leads development of the OpenST Protocol, a framework for tokenizing businesses. In September 2018 OST introduced the OpenST Mosaic Protocol for running meta-blockchains to scale Ethereum applications to billions of users. OST KIT is a full-stack suite of developer tools, APIs, and SDKs for managing blockchain economies. OST partners reach more than 300 million users. 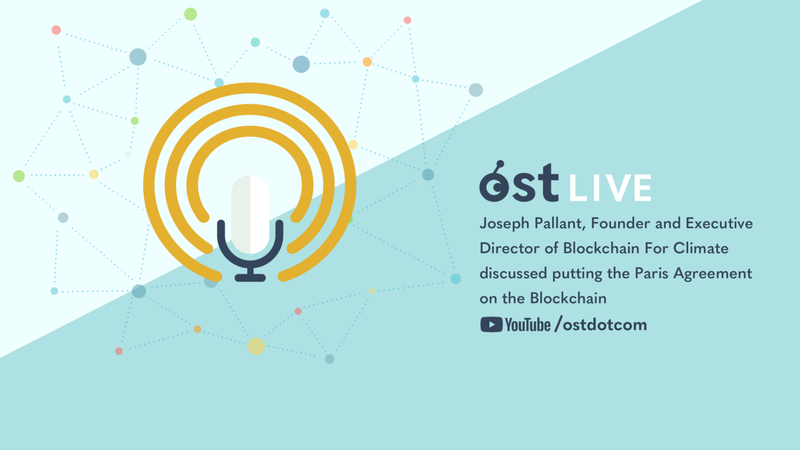 OST has offices in Berlin, New York, Hong Kong, and Pune. OST is backed by leading institutional equity investors including Tencent, Greycroft, Vectr Ventures, and 500 Startups.